The deteriorating U/v effect put off by the sun can quickly undermine the coatings protecting your yacht’s beautiful cosmetics. Whether it be paint, gelcoat or high build polyurethane cap rails, overtime these surfaces will need a re-coat. Painted surfaces need a polymer wax coating at least every 6 month by a professional yacht detailing team in order to prevent oxidization from setting in and fouling the paint, cap rails need a fresh, durable polyurethane coat at very least 1 time per year to keep that shine and show status. High gloss exterior wood tables typically need a re-coat every 2 years to keep in optimal show standing. Recently we finished a large project on a 130 Trinity that called for all exterior table tops to be removed, sanded down and build back with 6 coats of a high build, high shine polyurethane coating. The job took months to do but the finishing came out great. 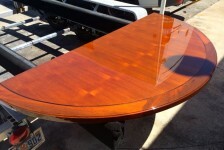 Below are 10 tips to help you during your next table refinishing job. 1) Take pictures of tables before removing them, you’ll be glad you did later, these will protect you against any false claims once the tables are back on the boat, look professional when referenced for your estimate and will build your portfolio for the future. 2) Just looking at a high gloss table top aboard a yacht will scratch it;) When removing tables make sure to use white cotton bed sheets and clean cardboard to protect the edges. Make sure to have plenty of muscle as these tables weigh like stone slabs. Note: Using colored bubble wrap or any plastic wrapping will tattoo the table when touched by sunlight..forming a milky impression on the finish… you have been warned. 3) Go over with the captain and mate the damage to the tables and convey in perfect english and through a written estimate what will be performed on each table and the extent and location of the blemishes to be removed. 3) Make sure your storage or where you will re-finish the tables is below 80 degrees always, these coatings get soft with heat so be careful, lay down flat and not onto of any impression. 4) When starting your 1st sanding steps use 220 (buy a stick it roll to save money,,yes you will use it all) follow up with 320, 600 and 800 grit before thinking about polishing. 5) Remember the edges of the table is where the coating is the thinnest so sand very lightly here, long finishing strokes only. I recommend sanding by hand to get a good feel of the coating 1st before moving to a machine. Do not use a DA ! 6) Should unforseen blemishes deep within the table’s coating appear after you start sanding inform the captain and mate of the time and cost for removing as very much work and product will be needed to remove. Often times the 80-20 rule applies here with %80 of your effort and boat’s money will be spent chasing something that often time will go unseen once the new coating is on. When in question, speak with the captain. 7) PREP is the key to table finishing- Tables %90 of the time, depending on size, need to be shot (compressor, air gun) to achieve excellent form. With this said make sure your paint booth has %0 contaminants and is sealed off like a forensic hard drive inspection room. This prevents elements from floating down onto the new wet coating. 8) Mix ratio will vary depending on humidity and time exposed to the elements when coating larger surface areas. Take these things into consideration to assure level flow across complete substrate. 10) Take pictures when finished to document the condition as they leave your shop. Be extra careful on transport use alot of sheets and clean cardboard to prevent dings and scratches that could ruin all effort. Install tables using a good hydrophobic bedding sealer before inserting screws to prevent moisture from penetrating the tables. BAM! Your almost finished.. Remove all coverings before final inspection with the mate or captain. Submit your invoice, get paid and go buy yourself a beer.